I've not even booked our Disneyland trip yet as I'm waiting to see if the flight prices decrease at at all but I have it all priced up and ready to book for when they do. I've been making lists and writing up an itinerary for our trip to make sure we can do as much as possible during our visit. I took Amelia back in 2014 when she had just turned two and she loved it but it's going to be even more magical this time with both of the kids! I thought I'd share some of the bits which are currently on my eBay and Amazon wishlists to purchase for our trip. I may have even made a few sneaky purchases already woops, but I just couldn't resist! I have separated them onto two different wishlists simply because there was too much for just one. Obviously the kids haven't asked for any of the items below, it's just items which I think will make our trip more enjoyable and a few essentials. I am also planning a shopping trip later in the year to Primark & H&M to buy some disney themed clothing items for us all to wear for the days at the park but I have included a few personalised t-shirts. 1. Mickey Mouse LittleLife Toddler Daysack - these also come in lots of different disney characters, great for days at the park with toddlers. Will also be buying Autograph books before we go and I've found this one for Harry and this one for Amelia which I think are both super cute and they'll love filling them up with autographs. 1. Pom Pom Hat - I've found a similar hat to this in H&M which is so Disney! 3. Disney Minnie Earphones - How cute are these!!! I need them in black, white and pink! 6. Micky Mouse Backpack - I'm not sure if this will be too small but I LOVE it! 9. Disney Passport Holder - Love this! 10. Minnie Mouse glitter coin bag - Couldn't resist buying this! I've never really been much of a Disney fan if I'm honest but I couldn't resist buying everything themed haha! I'm sure I'll find more before we go so will no doubt share another wishlist type post or park and travel essentials. I bought this "Days Till Disney" Plaque on eBay the other day so I can't wait to start counting down and watching lots of Disney films with the kids over the year. 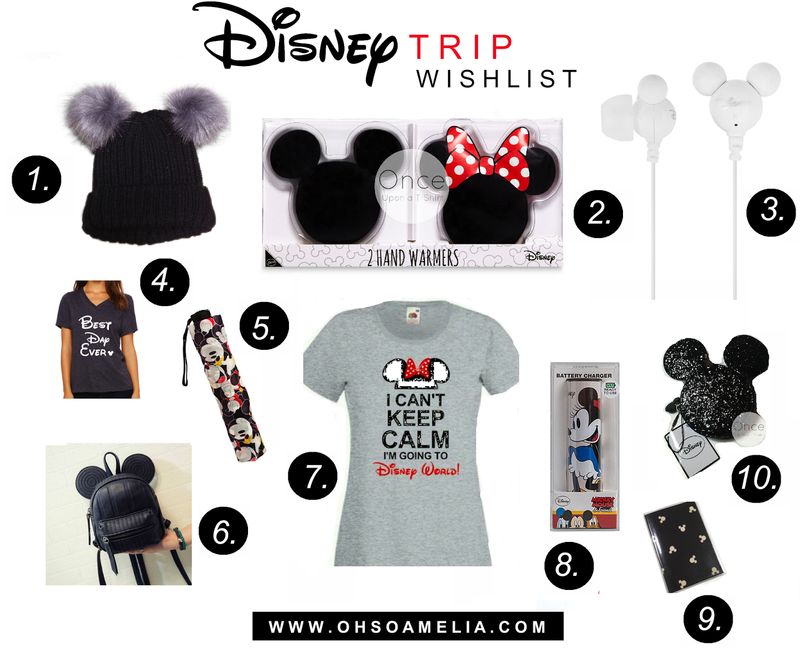 Do you have any favourite items you took to Disney? I love everything you have chosen. We are in the process of planning Disney this year. I haven't taken the kids to Disneyland just yet. I was kind of planning this year but hubby said no. Maybe next year as Chloe will be three then and Matthew 5 1/2. I think I twas 7 or 8 myself when I went. 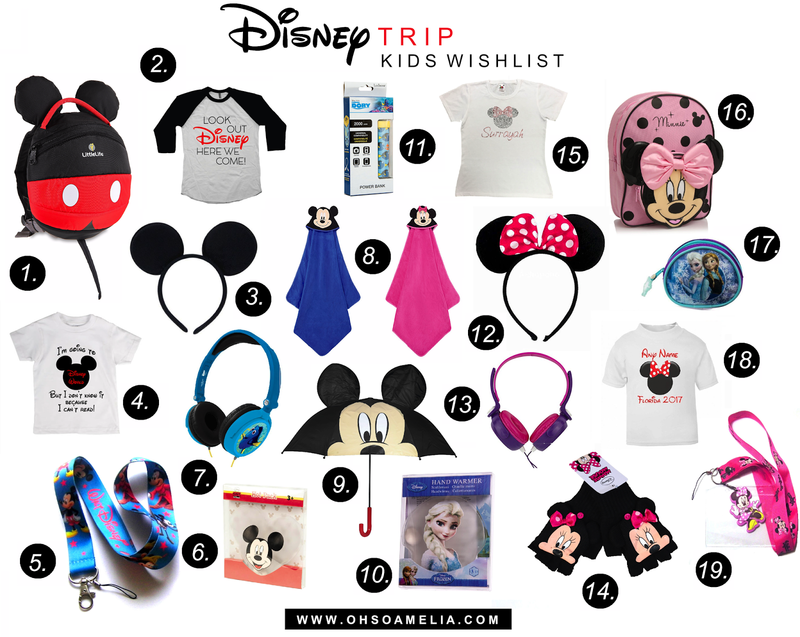 I'll take one of each of these, especially that super cute Minnie Mouse backpack!